Miniature painting and Star Wars prop builds. For the Skin tones I used a mix of elfic flesh, sandy brown and lava Orange, mixed until I got a good base tone, fairly dark and just enough lava orange to match the brown to keep a fleshy tone. I have gone gone fairly brown on the undersides of the eye brows and have done 2 highlights quite watered down for a smooth transition. I think I will give the head a coat of satin varnish before I go for the pupils so I have a chance to fix any mistakes. I have put a free hand chequer on the knee pad just to add a little bit extra, Done the wolf grey highlights and will get to the spot highlights. 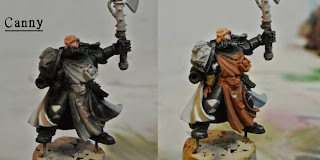 The tabard and and areas that will be gold NMM base coated with sandy brown. I mixed a small amount of sick green to the sandy brown to get the variation on the pouch and holster. I will go for a more leathery look but would like it to be a little different. I have base coated areas that will be white in wolf grey, I may end up painting the shoulder gold also, not quite decided. . .
Black Templars - Birthday Pressent. Now with the ability to design and print 3d parts, I have always wanted to build star wars related props with the new Rouge One movie coming out and seeing the Rebel Commando helmet I knew this was going to be my first prop to make. I started painting Miniatures in 2013 and have really enjoyed the challenge, it started with painting pieces of the Board game Descent. Im now hooked on painting and the bonus is its more relaxing and rewarding than video games. Best achievement so far, 1st Place Games Workshop Wellington Golden Brush in the single miniature catergory with the Dark Angles Librarian from the Dark Vengence Box set. Michael Herm’s ‘BISHOP’ and More! Voluminosity, killing colours and the crap guesthouse - a story of non metallic metals with Alfonso Giraldes.